Estate agent: The property is in very good nick. Ready to move in! Me: Obviously, you’d want to update that bathroom. Estate agent: Well, … that’s all down to personal style, isn’t it? My deepest sympathies – every time I have to hunt for habitable housing in London I nearly lose my mind…and several estate agents nearly lose their lives. Such a needle in mouse-infested haystack chore – good luck! Is that a “classic” look? LMAO there is vintage chic, and then there is ^^^^ that haha. Actually a lot of our house smacks of bad taste, its going to take us ages to get it all done, I only just noticed the kitchen roof has embossed paper on the roof the other day, I have been here 3 weeks lol. Oh my! That is quite some wallpaper. haha, is that the bathroom???? It’s … umm … retro? I lived with a family in college who had that print for sheets. So early 90’s! Wow that is some wallpaper! Hey, how did you get a pic of my bathroom! It’s a bit, erm… busy? Wow matching wallpaper and prints – knew my bathroom was missing something! So what’s the problem? Delightful wall paper, match-y colours, white tiles. 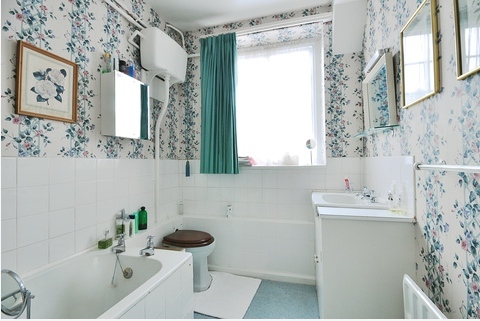 I bet it’s just like Bridget Jones’ Mum’s bathroom!